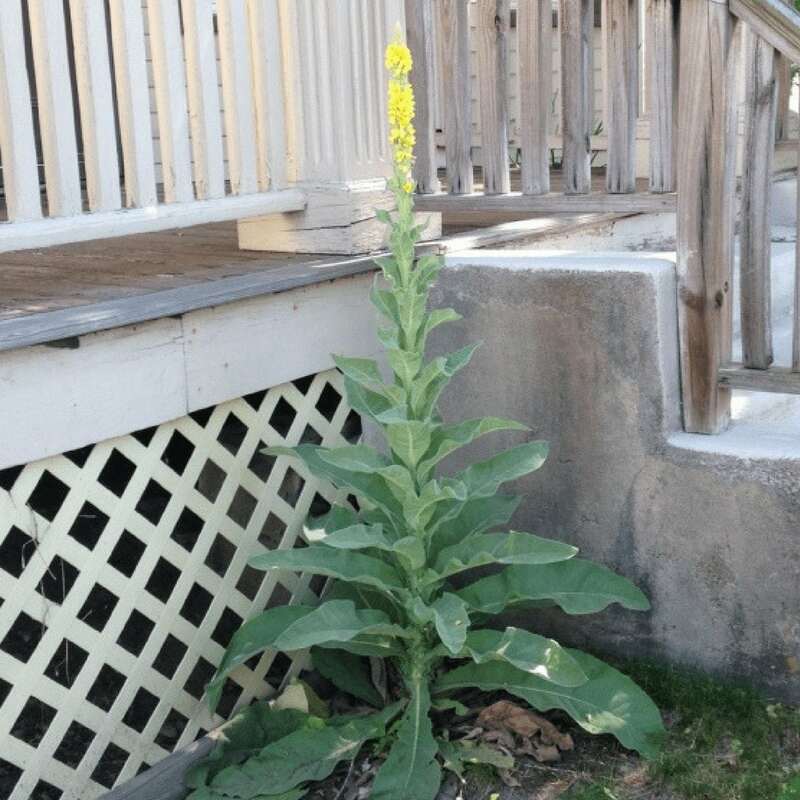 Mullein is a fuzzy plant that starts out small, but in its second year can grow over six feet tall! Mullein is a good friend to people who challenge their lungs – whether it’s with smoke, particulate, or any other crud we breathe in. It’s particularly great when that “crud” is dry, dusty, and caked on. 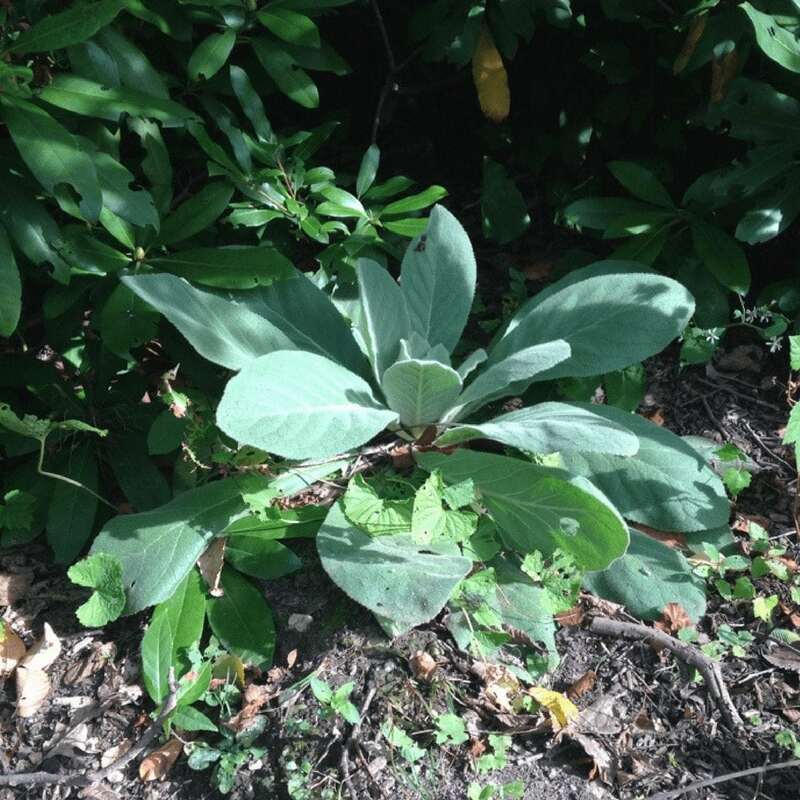 Mullein helps to drive moisture to the lungs, and to expectorate the crud that needs to get out. Tea or tincture are both effective for this – and pretty fast acting! Whether you’re living in an area beset with fires (like almost all of the northwestern US right now! 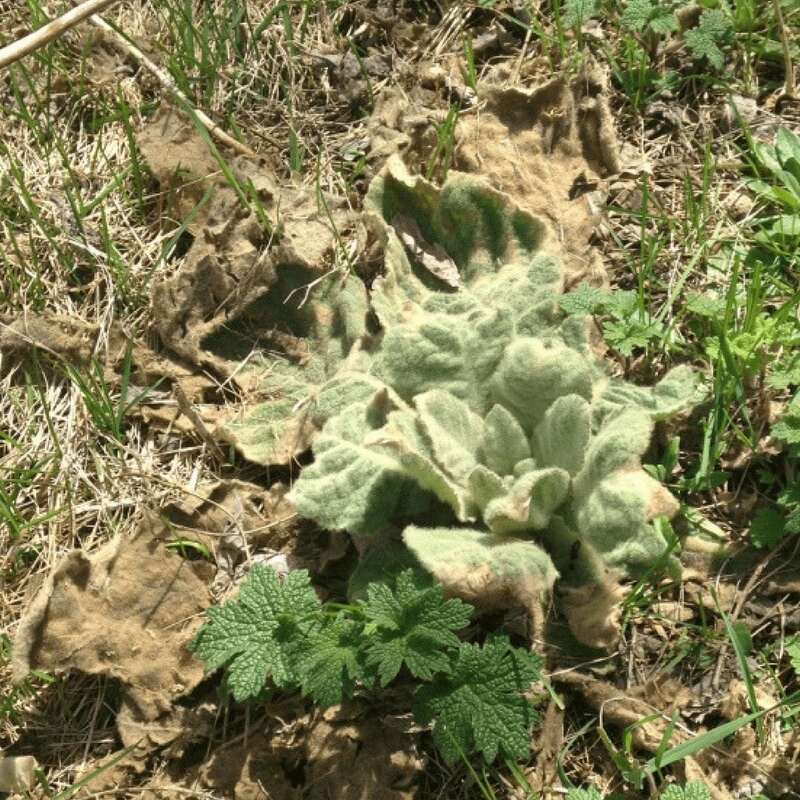 ), in an area that experienced earthquakes and there’s resulting dust and particulate in the air (like many places in Mexico right now), or if you work in a woodshop or have other work exposure, or if you’re a smoker – Mullein is helpful even when you can’t change the circumstances you’re in. Sure, you might still have to breathe in the gunk, but Mullein can be shoveling it out to help your lungs keep up! We like to put Mullein leaves in our winter syrup (because in New England, we get wet lung infections but we also live in very dry homes, which makes for pastey gunk in the lungs), and it makes a great tea, too. And did you know that you can smoke the leaves? For a wet boggy lung infection, it’s actually quite a handy medicine! If you have a dry hacking cough, this wouldn’t be a great option – because the dry heat of the smoke would just irritate that more. But if you have a deep, wet, phlegmy cough, it might make you feel much better! Lately, there’s a dry upper respiratory cough going around town, and a student brought in a lovely tincture blend of Mullein, Yarrow, and Olive leaf. It was delicious and quite effective! Many people like to make infused oil from Mullein flowers, which is quite lovely for ear issues. I don’t really like oil in my ears so for ear infections, so I do a hot onion pack instead. But warm Mullein oil is great if you don’t mind the feeling of oil in your ears – many people even find it soothing – and it’s perfect for kids. Garlic infused oil is also popular for ear infections, but Mullein has the benefit that it doesn’t smell like you’re wearing Garlic perfume! It’s also great for folks with a lot of hardened ear wax: put in a drop or two after a hot shower, or after steaming your ears. the mullein flower oil will soften the hardened wax and make it easier to remove. On this Mullein plant, you can see last year’s dead leaves – they’re brown and fuzzy, and kind of long, whereas this spring’s leaves are green and still kind of curled up. Even though it’s still small, last year’s dead leaves are the giveaway that this is a second year plant. By the end of the season, it can be six feet tall – which means a LOT of leaves for you to make medicine with! 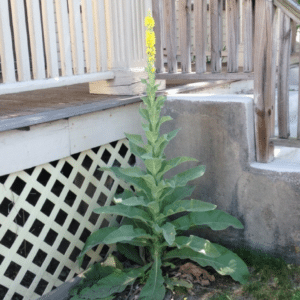 Mullein is a great help for structural issues, especially back pain – and it’s no wonder, looking at what “good posture” this plant has! We’ve tinctured leaf and stalk for helping with back pain from over-exertion or strain, and the root for this and also for incontinence and pelvic floor issues. We tried both of these on the recommendation of Michigan herbalist Jim McDonald, who was experimenting with it, and lo and behold! Success! 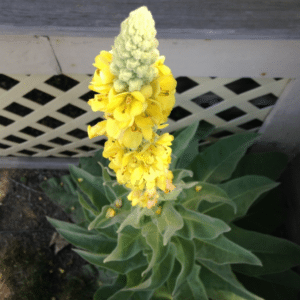 I’ve used mullein root both for supporting spastic bladder issues that come as a symptom of MS as well as incontinence issues that come from pelvic floor insufficiency, with positive results. for these actions, we work with tincture. 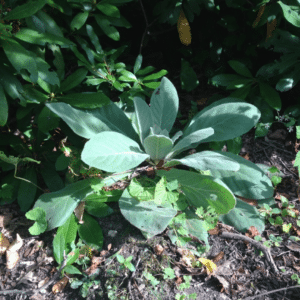 Michael Moore, as quoted by Kiva Rose, has written about this action, but largely these structural applications of Mullein have fallen out of popular use. It’s high time we bring that back! How do YOU love to work with Mullein? Check out our Foundations in Holistic Herbalism program – a complete resource to learn to work confidently with herbs every day of the year! Mullein is a great help for structural issues, especially back pain. It’s high time we bring that back!